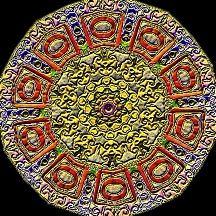 The Flatland Digital Artwork Clip Art Gallery: Iridescent Spinners. 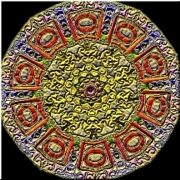 An iridescent circle with a gold star in the center of a gold leaf background. The star is surrounded by a design in coral-colored foil. The outer rim is a silvery iridescent foil. The entire image is on a black background.